Following from the last post, on how to build a wardrobe that will keep you cheerful and looking fabulous, here are some other items that I think pretty much everyone needs. But of course, you’re all big girls with your own favourite styles, so take these in the spirit they’re intended, as guidelines. 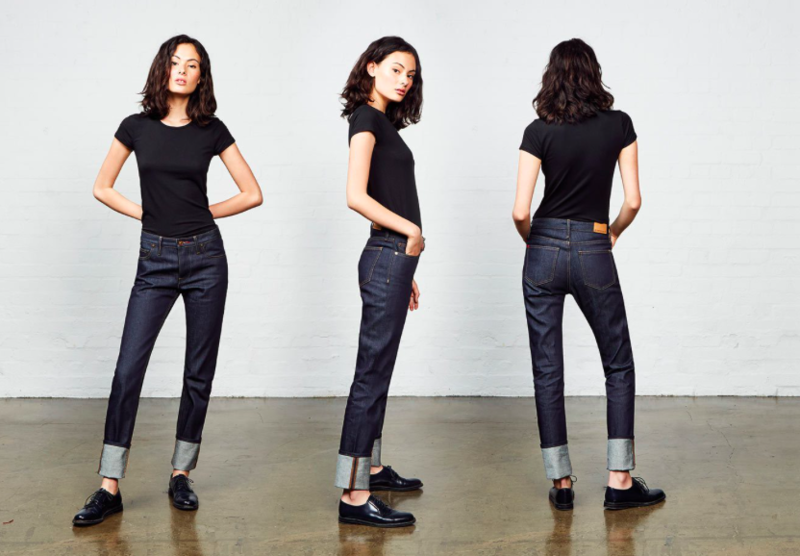 I like a straight, slimmish legged jean – good for a boyish shape – long enough to wear with boots with a heel, then I can always roll them up with flats. 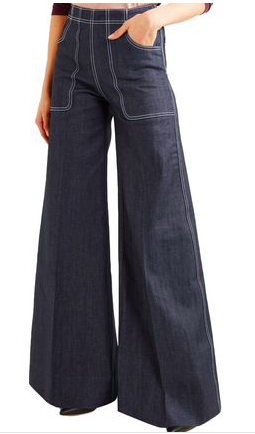 On a curvier shape, a wide leg jean, cut close round the hips, can be very flattering. A friend of mine has just bought a pair like these which fit her like a glove. The Burberry jeans below are the ‘Ur’ wide legged jeans shape, so consider them as a template . You can also buy similar styles in Topshop, Boden and Zara. I also like black jeans but finding a pair at a reasonable price that stays black is tricky. 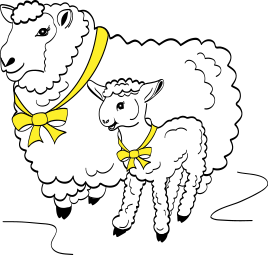 Back in the day I bought the perfect pair for Ms Lamb – they were a sale buy from Acne studio but since then we’ve never found them on sale again. On the latest season of Ru Paul’s All Stars, drag queen Monet Exchange appears in the workroom, all dressed down in a roomy kaftan. “Now that’s an eatin’ dress” comments Ru. Ok. So I get it. Not everyone is a big fan of the fierce queens on Drag Race. But fact is, we all need an “eatin'” dress: one that looks good while being comfy, flattering and able to take a turkey dinner in its stride. You probably have a dress somewhere in your wardrobe already that fits the bill. I have a couple of COS and Me&Em dresses that are definitely “eatin'” dresses. I like mine to be A-line, not too restrictive in the waist area and not at all revealing in the stomach section. I like them either brightly patterned or in a good, cheering colour. There should be nothing clingy about an ‘eatin’ dress. Or structured. Or scratchy. If they are too sack-like, they won’t cheer you up, because it will only make you feel one step up from going out in a bin bag. Here are some I found in the sales, which would fit the bill if you don’t have favourite already. My Mum had a whole wardrobe dedicated to the coats that she liked but never got round to wearing; two for coats she didn’t care for but couldn’t throw away and another full of coats she actually wore. 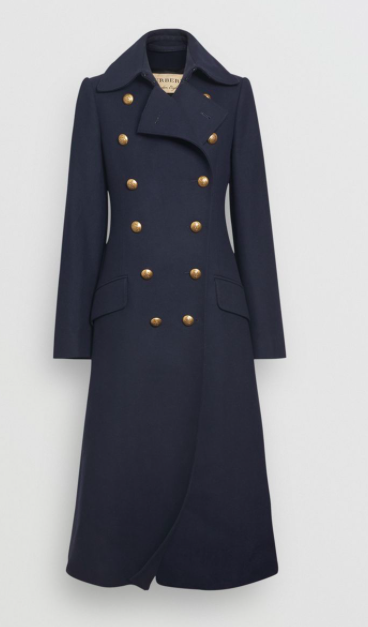 As my own groaning coat hooks testify, I also love a coat. But truth to tell, if you’re off a less maximalist temperament, you can get by comfortably with two good coats: and one should be as fabulous as you. Knife-edge tailored, vibrantly coloured or simply in a fabric that demands a stroke, everyone needs one coat that cheers the soul. You don’t have to spend a fortune on them: I have a coat from Zara that fits this bill. Sales are your friend if you want something that’s more of an life long companion. My friend just bought this beauty in the sales. 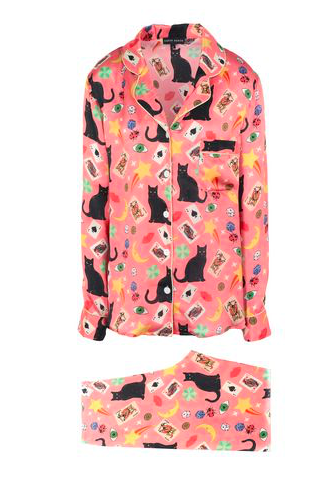 She’ll be sashaying in this into her eighties. Let’s face it, you really can’t be walking the dog in a fabulous fun fur, well you can but it’s a sad sight in the rain when you can’t shake yourself off like the dog. You leak gently for days afterwards. So what we’re talking about here is a good outdoor, practical garment: down-filled perhaps, or shower proof, depending on your requirements. My own Wintery version is from the much missed Uniqlo Jill Sanders collaboration, found in a second hand shop for a tenner. It is full-length. trapeze shaped, navy blue and very warm. 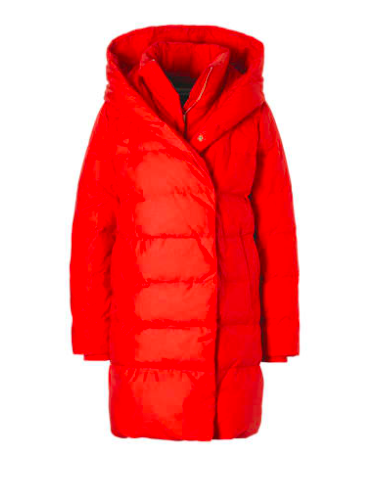 This red coat from Spoom reminds me of it and if anything is even nicer. 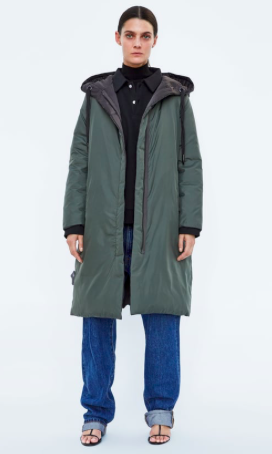 And for something more subdued, here’s a bargain from the Zara sale – it’s reversible so actually two coats in one. I love my PJ’s. But mine are an endangered species. In an ongoing campaign against feminine smalls, Tilly Mint the dog, has eaten the gussets out of all mine, including a pair of beautiful silk Karen Mabon lovelies (sob!). For Christmas, Mr Mutton brought me a pair of beautifully soft, brushed cotton pyjamas from British Boxers a relatively new brand who only make underwear and night wear and of an excellent quality. 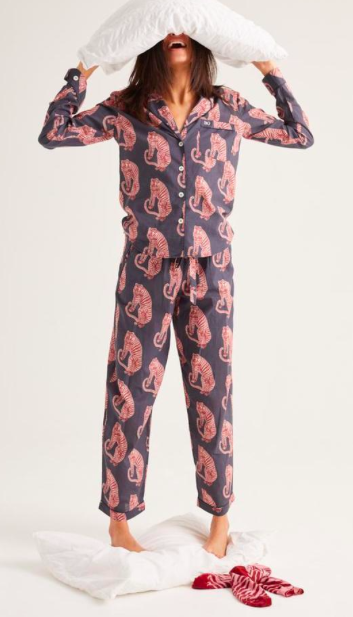 Another company for chic nightwear is Desmond and Dempsey – great patterns, but not cheap, so hide them away from predatory terriers. And finally, for old times sakes, these are reminscent of my own Karen Mabon sample sale lovelies, which provided an expensive afternoon’s fun for a bored Jack Russell cross. Finding these is mostly a matter of luck. My friend Gill is an especially astute shoe spotter, so when she was casually sporting some very nice suede lace ups, we all immediately wanted to know where she’d found them. 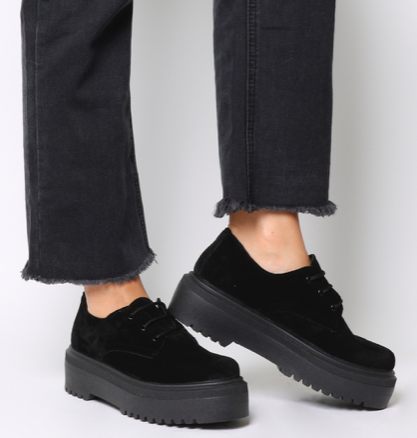 It turns out they are these, from Office: chunky enough to look completely un-matronly and to give you a little height and leg length and bouncy enough to put a spring in anyone’s step. I can hardly bear to write yet another peon to Blundstone boots. You must think I am on a Blunnie bunce. 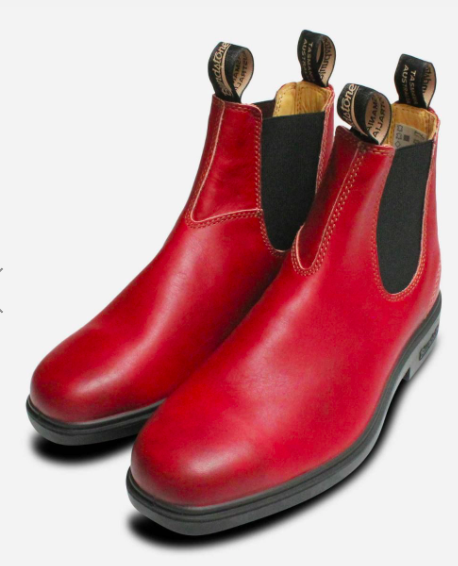 (I can promise you that no one has ever offered me a penny or a pair to say anything nice about anything, though Damart did ask me to look at their catalogue and see if there was anything I might feature) But honestly, these boots are made for walking. And that’s just what they do. May I recommend once more the ‘dress’ boot style, which has a slightly squared off toe. I have these red ones but they are available in more muted shades for the less Wizard of Oz fixated. There are lots of other things that make a wardrobe zing – a great pair of tailored trousers in navy, black or grey trousers; a wonderful chunky jumper, whether it’s from Toast for £200, J W Anderson for just shy of £1000, bought in a vintage shop for a tenner or knitted yourself; a beautiful tailored jacket – in tweed, or in a fine wool; a coat in soft, buttery leather. You don’t need a truffle-hunter’s nose to root them out; a PhD in shopping or a celebrity budget. You will know that it’s right for you when you see it. Put it on, look in the mirror and if the way it makes you look and feel makes you want to do a little dance, then you know it’s for you. Back to Basics: What Every Wardrobe Needs, Part 1. That is a lovely jumpsuit. 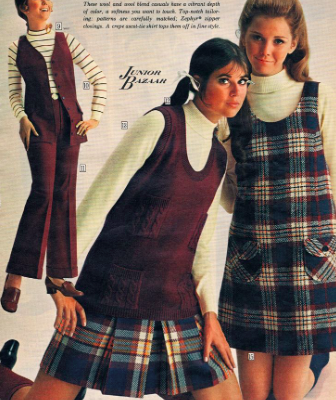 I’m rather interested in that jumpsuit myself! A tiny warning about the lovely Kitri jumpsuit, Mrs M. I’m on the short side (5ft 1 and a half) and it’s just below ankle length on me. 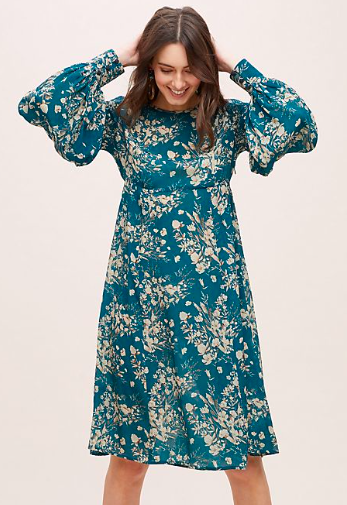 I wear it with chunky flatforms and the length is great – a joy not to have to take the hems up for once – but on longer-legged ladies it would definitely be a ‘cropped’ look. Otherwise, wonderful. I worried it might make me look like a superannuated children’s entertainer (which, being a late 50s primary school teacher I kind of am anyway), but it’s terrific and draws many compliments.